Project Inspiration: Make this Stunning Mixed-Metal Lariat! 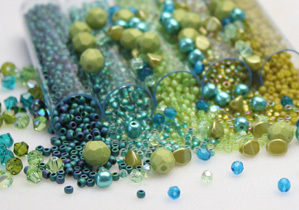 Hello Bead Lovers, Leah here from Eureka Crystal Beads! I’m here to show you some of the steps to create this stunning mixed-metal suede and Swarovski Crystal lariat! If you’re unfamiliar with this necklace style, it’s a style that uses NO CLASP, but can simply tie or wrap around your neck! Depending on how long your lariat is will determine how many ways you can tie it. Think of the various ways you can tie scarves around your neck and those are the similar ways you can wear a lariat necklace. OH YES, my friends!!! Not only do I love mixing metals for a funky look, I also love utilizing super sparkly Swarovski Crystal Beads and Swarovski Crystal Pendants that match along with those same lovely neutral metallics! Colors like Crystal Golden Shadow, Crystal Silver Shade, and Crystal Rose Gold 2X are just beautiful when paired with a variety of metals. In this particular design, along with using both gold and silver wire, I also looked to use a variety of textures as well. This meant not only various sizes and shapes of crystals, but also different wrapping techniques and metal finishes. Pictured here is the following: Matte Gold Plated Rolo Chain, 2″ gold-plated ball-end head pins, 26 gauge half hard round sterling silver wire, Microfiber Suede Lace, Along with various Swarovski Crystal beads and Swarovski Crystal Pendants! Along with all of the lovely beads and wires I used, I needed to utilize my wire working tools: Side Cutters, Chain Nose Pliers, and Round Nose Pliers. Take a look through the thumbnail images here. You can see that in the first one I used the sharp tip of my beading tweezers to poke a small hole in the end of my Microfiber Suede Lace. Though this hole I’ll be able to thread some 26 gauge half hard round sterling silver wire and wrap a loop closed there. If you need a refresher on how to do this, check out my VIDEO on wrapping loops with wire! Once a loop was wrapped shut, I threaded on a 6mm Swarovski Crystal bicone bead and then wrapped another loop on the other side, threading the end link of a 2″ piece of Matte Gold Plated Rolo Chain before closing it. Repeat on both sides! In this next set of thumbnail images, you can see how I’m utilizing the 2″ gold-plated ball-end head pins to easily attach some of my larger Swarovski Crystal Pendants. Play with where you hang them! I put one larger on at the bottom of each 2″ piece of chain, and then played around with adding more by staggering where they would sit on either side. Here you can see a close-up of the finished bottom portion of my lariat necklace! Lastly, I’ve included some pictures of my wearing the finished lariat in 2 of the ways you can tie it around your neck! I hope you find this project inspiring! Even if you’re not comfortable stepping into the realm of mixed metals yet – you can certainly stick with whatever metals and colors you love to wear!! Previous Post Birthstone Breakdown: Everything you need to know! Next Post May Birthstone: All About Emerald! love the lariat! How big are the pendants?